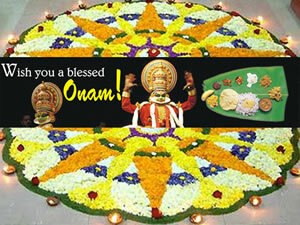 Onam is a four day festival that is usually celebrated in the months of August to September. Onam is an Indian festival that is commonly celebrated as the people in the states of Kerala and Tamil Nadu, India. It is a four day harvest festival that is celebrated in the Malayalam month of Chingam (which falls from August to September). The four days of Onam starts from Onam Eve (Uthradom), and ends on the 4th Onam Day. While Onam is a harvest festival at its heart, legend has it that it is also the also the time when Mahabali, the great king of the Malayalees, returns from the underworld to visit his people. As the story goes, King Mahabali was a great and powerful king, who gained power in all the three worlds: heaven, earth and the underworld. Eventually, the gods started becoming apprehensive and asked Vishnu to help. However, before Vishnu killed Mahabali, he granted him a boon, as he was a devote follower of Vishnu. Mahabali asked for the chance to visit his subjects once a year. Hence, every year on Onam, Mahabali does. In order to welcome King Mahabali, people wear new clothes, decorate their house, and place a carpet of flowers in their entryway. Parades and fireworks are held in towns, people are often dancing in the streets offering prayers and worshipping Mahabali and Lord Vamana, the avatar of Vishnu who killed Mahabali. A feast called sadya, and served on plantain leaves, is hosted by each family. Another custom of Onam is the snake boat race, called Vallamkali, in which long, huge, and graceful snake boats with as many as 100 oarsmen per boat participate in a race. Well-known races, such as the Aranmula Boat Race and the Nehru Trophy Boat Race, draw thousands of spectators, both national as well as international. How is Milk converted into Curd?